The Opportunity Youth Playbook, created by the Opportunity Youth Network, highlights promising practices, strategies and resources to help communities support 16 to 24 year old boys and young men of color who are neither in school nor employed. Such young people — commonly referred to as “opportunity youth” or “disconnected youth” — have distinct talents and needs, and require dedicated strategies above and beyond those targeted at boys and young men of color more generally. There are more than 1.5 million disconnected young men of color in the United States. And while overall rates of disconnection are likely to go down as the country continues to recover from the economic recession, history suggests that disconnected young men of color may never fully recover. Research has found that young men of color are disproportionately likely to be disconnected from school and work. The disparities are driven by the interplay of gender, race and inequities among the communities in which boys and young men of color grow up. Boys and young men of color are resilient but as leaders we have to do more than hope that disconnected boys and young men of color “make it” despite the adversities they are up against. 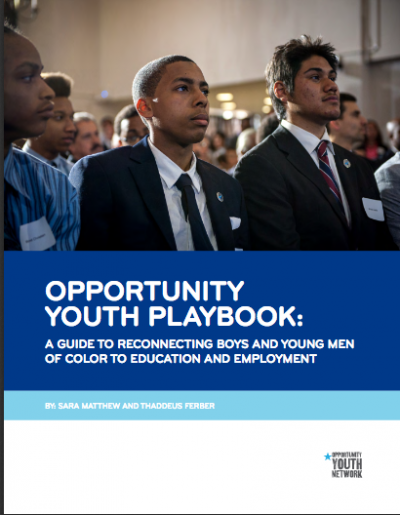 The Opportunity Youth Network developed this playbook to help communities take action to reconnect disconnected boys and young men of color. The toolkit begins with a set of cross-cutting strategies and then is organized by the six critical milestones enshrined by the White House’s My Brother’s Keeper Community Challenge: entering school ready to learn; reading at grade level by third grade; graduating from high school ready for college and career; completing postsecondary education or training; successfully entering the workforce; and reducing violence and providing a second chance. Each section includes an overview, strategies for taking action, and links to key organizations and resources. Check out The Opportunity Youth Playbook!